Needle roller bearings are very similar to cylindrical roller bearings in their make-up except that their rollers have a length anywhere between 3 and 10 times their diameter. This means that the ratio of the bearing’s external diameter to the inscribed circle’s diameter is small. Although they have a low cross section, needle roller bearings have a high radial load capacity and are exceptionally appropriate where radial space is limited. 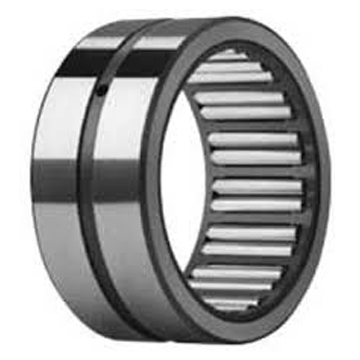 There are several types of needle roller bearings available, and many have no inner rings. The drawn-cup type has a pressed steel outer ring and the precision (solid) type has a machined outer ring. There are also cage-and-roller assemblies without rings. Most bearings have pressed steel cages, but some are without cages. Drawn cup needle roller bearings have a drawn outer shell serving as a raceway for the rollers and are installed with a press fit in the housing. They are ideal for many of the following applications: transmissions, transfer cases, engines, valve trains, steering and braking systems, axle supports, outboard engines, textile industry, power tools, copiers, fax machines, paper-moving equipment, and appliances.